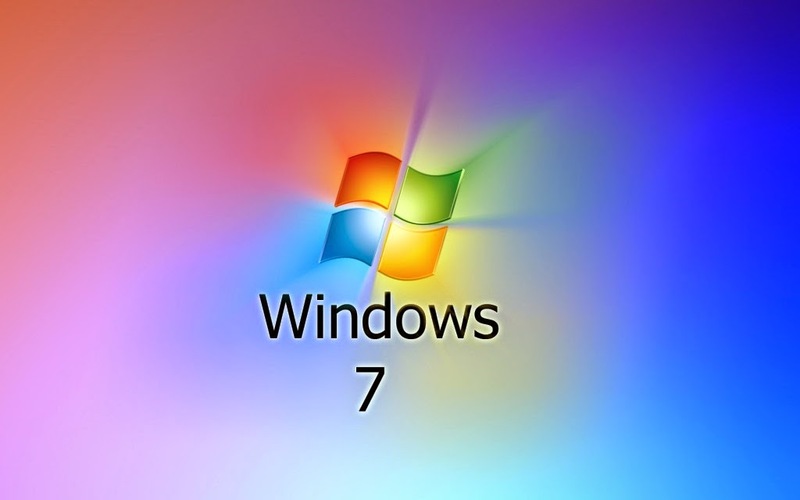 This post shows you step by step instructions for installing Windows 7 operating system from Microsoft.This tutorial is especially for beginners. So that they don't need to contact a Computer technician and spend money for that. There are some basic things to know. There are different type of Windows 32-bit and 64-bit. (See: Difference between 32-bit and 64-bit Windows OS). ->16 GB available hard disk space (32-bit) or 20 GB (64-bit).The harddisk should be in NTFS Format. 2. Press F2 or Delete button (depending on your motherboard) to enter computers BIOS(Basic Input/Output System). IMPORTANT!!!!! These Options may vary according to the motherboard. If you face any difficulty using this method try this simple method. 2. Insert your DVD/USB Drive. 3. Now click F10 or F7 (depending on your motherboard) to enter the Boot Menu. 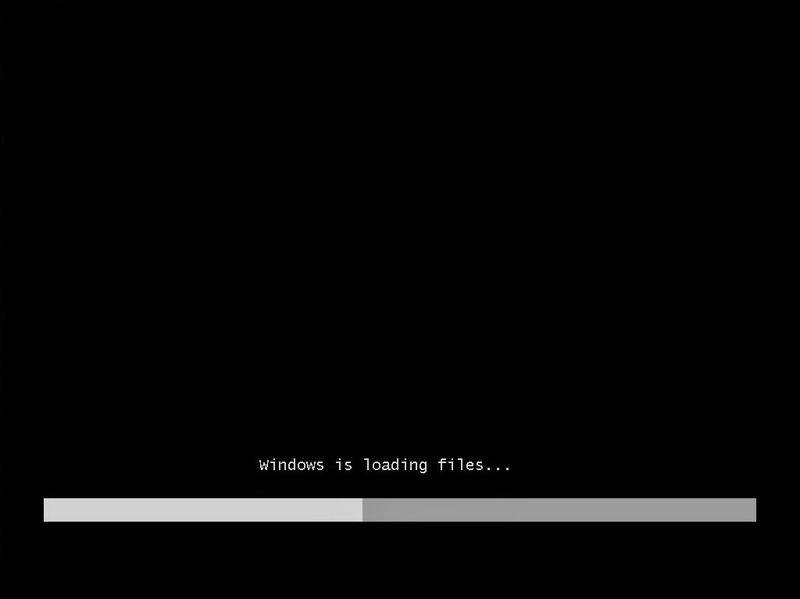 If the screen shows "Press any button to boot from disk" click any button.Only some time this message will appear. 5. 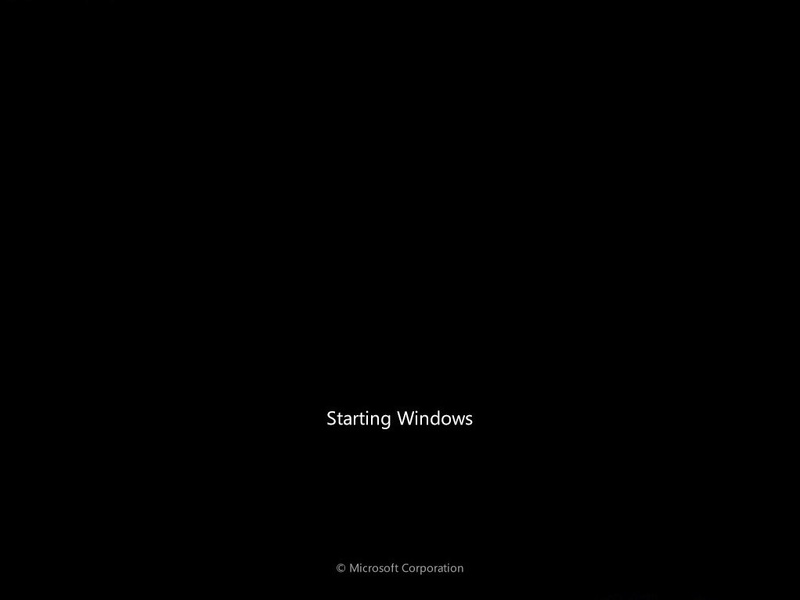 After a few Seconds The Screen will change and Show "Starting Windows".Wait for some time. 6. Now a new window opens. 7. 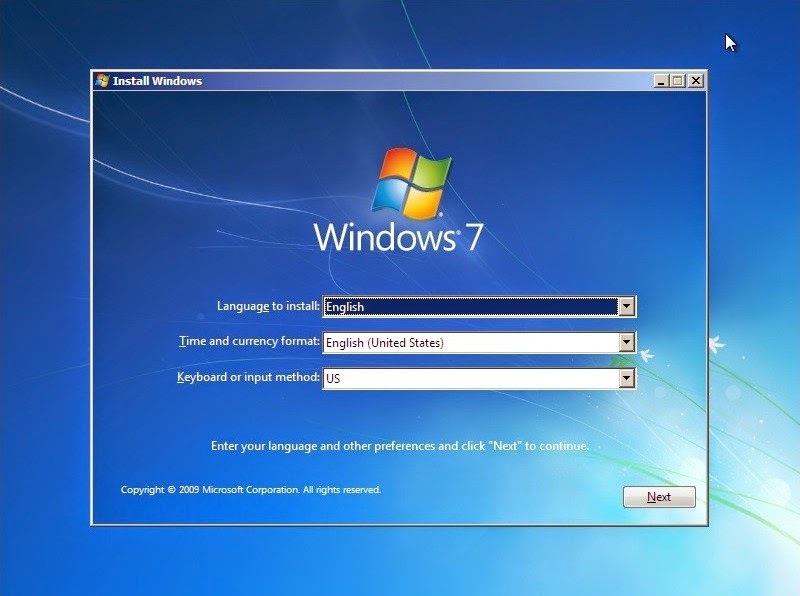 Select Language to install, Time and currency format, Keyboard or input method and click "Next". 8. Now Click "Install Now". 9. Wait for some time. Now a license terms page will open. Check the box "I accept the license terms" and click "Next". 10. The next page will ask you "Which type of installation do you want?" 11.Choose Partition for installation, if your computer has only one hard disk, it will be easy for selection, but if it has some Partition, you will have to consider which Partition to choose. If the space is Unallocated or want more drive options click "Driver options(advanced)". 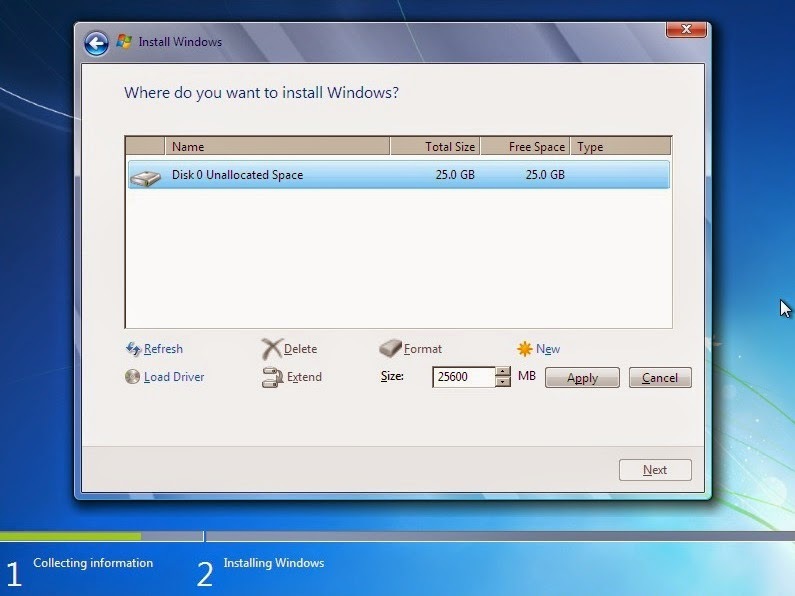 12.If you have no partitions, click "Driver options(advanced)" and click on "New" and set the size of your partition and click apply.Wait a second .Now click "Next". 13.Wait for Window to install.This is a long process and time may vary according to your computer specifications. During your system may restart several times so don't panic. 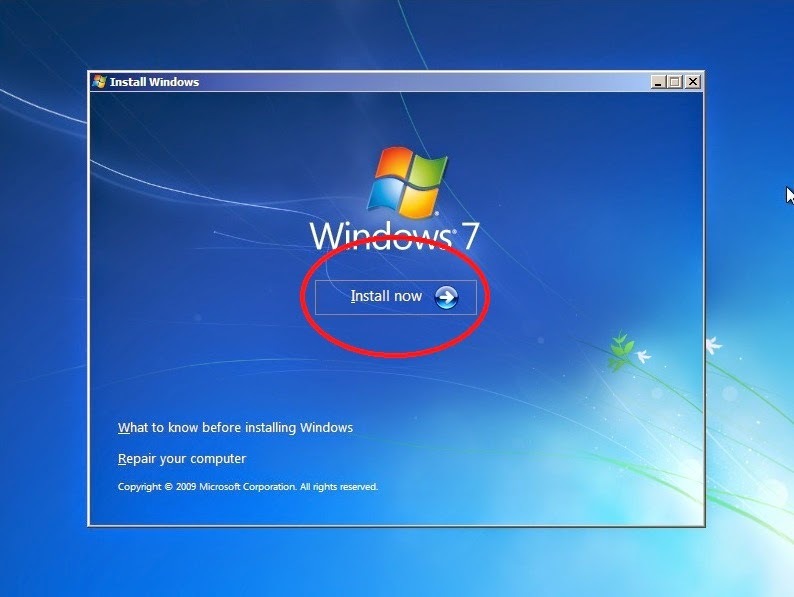 14.After Installation A new window will open to create a user account and computer name. 15.Type a password for your account, you can also Type a password hint to help in case of forgetting the password in the future, and then click Next. If you don't want to create a password, just click Next. 16.Type in activation code or key for your license in Product key box if you have any or Check in "Automatically activate windows when I'amonline". Click Next. 17.Choose how to protect your Windows.